Today, we continue the Gear Up marathon with an early look at a brand new product from an esteemed company. Osprey, a manufacturer well-known in the outdoor community for its impressive backpacks, recently released a new model, known as the Atmos 65. Keep reading to discover what great features this pack possesses. Who knows? For those of you in need of a pack this season, the Atmos might be just the item to help you Gear Up in the best way. Fans of the adage, “A place for everything, and everything in its place” will fall in love with Osprey’s Atmos 65. The nearly 4,000-cubic inch pack’s main compartment is top-loading, and has plenty of room for a lot of gear. The bag also has numerous pockets in which to place easy-access items for quick retrieval. There are two lid pockets, a convenient pouch, longer zippered pockets, two hipbelt pockets, a sleeping bag compartment, an internal sleeve for a hydration bladder, and side pockets for water bottles. The top pocket is removable, as well, which can streamline the pack if not needed. Other than abundant storage options, the Atmos 65 comes equipped with a variety of helpful features to add to your comfort during multi-day trips. The pack’s harness is adjustable, and is comprised of a lightweight alloy frame and mesh trampoline, known as Airspeed Suspension, that keeps your back cool due to its floating design that separates your back from direct contact with the pack. The hipbelt is also adjustable and is made of dense foam for support, with added mesh pieces for breathability. The Atmos 65 is built to handle up to 50 pounds of gear, which is more than enough strength for most multi-day excursions. It is available in three different color patterns, and is also available in a smaller (3800-cubic inch) and larger (4100-cubic inch) sizes. It costs around $240, which some will sneer at. 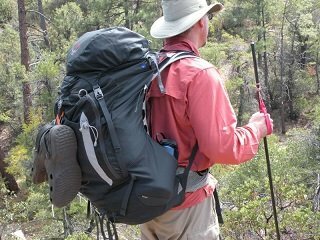 However, this is a fair price for a very good all-around pack that has enough storage for a myriad of items and offers a lot, as far as comfort is concerned. Finding a backpack that suits us can be difficult. There are many elements that we, as individuals, desire, and it’s nearly impossible to find one product that satisfies our needs. The Atmos 65 from Osprey offers plenty of useful characteristics, though. From storage to comfort, and everything in between, the Atmos appeals to a variety of desires and is definitely worth a second, or even a third, look if you’re in the market for a new pack this season.